The Asian Qualifier for DreamHack Masters Dallas 2019 took place today with 8 teams fighting it out for a single slot in the Main Event. Out of the 8 participating teams, four were directly invited while the other four made their way through the open qualifiers. Unlike the Chinese Qualifier which was played over a course of four days, the Asian Qualifier commenced and concluded today itself. The 8 teams took on each other in a single elimination best-of-three format. The Thai team, Lucid Dream was in prime form today. They went on a hot streak of 6 back-to-back wins to secure themselves a spot in the Main Event. They started off by taking on the Japanese squad of Ignis. Securing themselves two comfortable wins on Dust 2 and Train, Lucid Dream went on to face MVP PK, one of the strongest teams in the qualifier. To everyone's surprise, the match-up was a walk in the park for Lucid Dream who defeated them on Mirage by a score of ‘16-10’ followed by a victory on Nuke with the scoreboard reading ‘16-5’. We lose with 0-2 against Lusid Dream, in DreamHack Masters Dallas 2019 Asia Closed Qualifier Semi-final. Making their way into the finals they came face-to-face with their local rivals Beyond Esports. Winning an all Thai final was the perfect ending that Lucid could have dreamed off. Lucid started off strong by securing a victory on their oppositions map pick, Dust 2 and went on to wreck them on Nuke. With this win, Lucid Dream has qualified for the DreamHack Masters Dallas 2019. 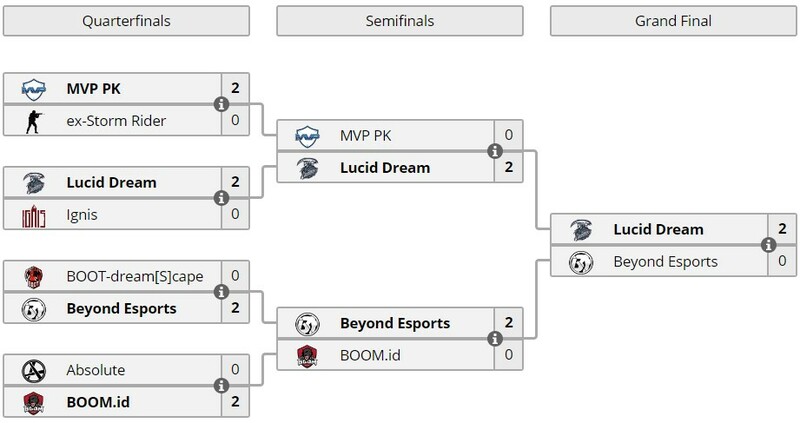 I did not expect Lucid Dream to come through as the winner of this qualifier, my money was on MVP PK without a hint of doubt and my second best guess was B.O.O.T-d[S]. The way Lucid performed was insane, they did not lose a single match in the qualifier and the way they handled MVP PK was simply stunning. It was their easiest match-up of the day. MVP PK is probably one of the best Asian teams to play Nuke but they got destroyed by Lucid, who went on to pick it against Beyond in the finals, stomping them as well. Lucid has certainly been practising Nuke and they seem to have had gotten a good hang of it. This hidden move certainly played out well for them, as they caught MVP by surprise while also toppling Beyond quite easily. On top of all this seeing, two Thai teams make it to the Grand Finals was also exciting. Talks a lot about the development within the region. All five players were in top form which only acted as a bonus for the side as all of them held an HLTV rating of more than one in all the three matches. Congratulations to Lucid Dreams! Let’s see how the team performs at the Main Event.